Math-Art Integration Project | Showing students that math can be connected to art and the real world! Showing students that math can be connected to art and the real world! After the teaching portion of our middle school math art project ended, there was still no visual presentation of the drawings. Deeply unsettled by this, Victoria and I (Pascal) made our way back to Mr. Dejean’s 7th grade class (our first class!) at King Middle School to give closure for the project and ourselves. The three of us decided on a plan to both digitize all the drawings (to be made into a slideshow/animation) and construct an installation of the drawings in the classroom. We went on a Wednesday (4/18) when Mr. Dejean had all his classes for short 40-minute periods. Making use of this time, we allowed the students to finish their large drawings for about half of the class. After the students finished their drawings, they came to our camera station to take a picture of their drawings. Then, we had them clip their drawings together using binder clips and string. After all the drawings were clipped together we fed the string through the holes of the clips and taped the string to the top of each clip so that the string was tight enough to allow for the pages to curve nicely. The students were AMAZING helpers with this. Toward the end of class, I was able to lead a short discussion with the students about the project with a goal of hearing what they had to think about the project. A surprisingly large number of students said that they thought the project was fun. Others agreed that they saw more connections between math and art. Finally, nearly all seemed to want more time on the project and already had other ideas to integrate math- like math and sports. The discussion was surprisingly nerve-wracking for me but I was happy to have the students be able to get out whatever emotions they had about the project. Following feedback from Victoria and Mr. Dejean, I also talked about my own math and art journey in the later periods which was also well received. After all of the periods flew by, Victoria and I wanted complete closure and hung up the final installation tying our drawings to eyescrews we put in the walls. The actual hanging was so relieving! – even though it was also unexpectedly exhausting. After all of the energy put in, we finally got our final product. Here are a bunch of pictures of the final installation. We finished off the teaching portion of our project with Mrs. Krasnow’s 8th grade class. This class again went by extremely quick as we had very short periods. I went to two days with Mrs. Krasnow’s class- Monday and Wednesday. The first day was with Risa and the math portion. The two periods are beginning to blend together in my mind. However, I remember the first period feeling like time flew and the second being a little bit more under control. The class (our first 8th grade class!) was so well-behaved that it almost seemed to go so smoothly that we didn’t even realize how fast time was going. As always, we went over the introduction and worked with the compasses, dilation, and similar triangles exercise. Like before, it just seemed to go so well. I do remember a couple students getting frustrated with the compass and the dilation, but overall I think the students simply just “got” what we were telling them. So, although time was slightly an issue, it seemed that the grade level helped a lot. The second day (and my last day :(!! ), I worked with Victoria and the art portion. Once again, the periods seemed to breeze by so nicely. One last time ( …. :'( …. ), we finished off the art movement slideshow and worked on the symmetry exercises. Everything went smoothly and the students understood and did the exercises really well. And that is how the teaching portion of my experience ended. So nice! Day 1 (2/27) of this week we worked again at Willard Middle School, but now with Mr. Ragent’s 7th grade class. As is no surprise to me, we ended up having to be very flexible with our curriculum. Something that I did not realize with Mr. Mac’s class was that he had back-to-back classes of Math and Science. He gave up his Science period in order for us to have larger blocks of class time which, now that I am aware, made a big difference. Mr. Ragent was not able to do this and so this week we are working with only 47 minutes of class time per period (as opposed to the 98 minutes with Mr. Mac and 85 minutes with Mr. Dejean). The time difference proved to be make a HUGE difference. However, also not surprisingly, we were able to make it work. I missed the first period of the day, but made it for the last three and each class felt like it zoomed by. However, the class size of Mr. Ragent’s classes seemed to make things a little easier. Each period was only about 20 students! It was really great to work with a smaller class size. One of the resource teachers even came in after class and told us that she loved that with 5 instructors in the class (Risa, Victoria, Mr. Ragent, the resource teacher and I), it was not noticeable that many of the students were “resource students,” which is a designation that they have special educational needs. Risa began the first two periods straight away with a review of right triangles, asking the students to write 3 facts that they knew about right triangles. Unlike with the 6th graders where we focused on ratios and similarity, this week with the 7th grade, our focus was on right triangles and the Pythagorean theorem. After the students wrote down their facts, Risa asked them what facts they had figured out. Many of the students answered that a right triangle has a 90 degree angle. Others immediately pointed out the Pythagorean theorem. Once Risa covered the Pythagorean theorem, she moved into the normal introduction with the Kandinsky painting and brainstorming of math and art vocabulary. After discussing the words that the students had written down, we continued into the dilation exercise and practicing using compasses which basically took up the entire rest of the class time. For the third period, Risa switched it up by starting with the “Math or Magic?” trick (described in the King Middle school entry). The students were very excited by this and it definitely grabbed their attention. However, in the end, it ate up a lot of time that we did not foresee and we did not have time to practice with the compass. After the first day, it seems like this week will be a really challenge to work within the time limits of the periods. I am very confident that we can do it, especially with the great, small class size and the students who seem very creative and interested already. We’ll see what happens. My second day (2/29 – leap year!) with Mr. Ragent’s class was great. On Wednesdays, the periods are cut even shorter than before and so we had only 41 minutes this time per period. Today, Victoria finished off the powerpoint slide presentation about the art periods, once again focusing on Geometric Abstraction, in order to continue the math art theme. The students overall appeared very interested in the visuals that Victoria presented. The last period began giving some interesting commentary on whether or not Sol LeWitt should be given credit for his work since he is not actually making the art. One of the students said yes and made the perfect analogy that a songwriter should get credit for the song written. I am writing this way in retrospect (it’s April 2), however, I can remember the last day from Mr. Ragent’s class pretty well because the students did a really amazing job with their large drawings. I remember very clearly one student who was uninterested in the entire week’s material and did not even want to start the large drawing. However, when the time came and the class was ending, she was one of the last students to leave and wanted to keep working on her drawing. Another student who was considered to have “special educational needs” also showed a similar peak in interest with the last drawing. I remember one of the instructions in the final drawing is to connect the points using thick wavy lines that go off the page on at least one side. After we went over this instruction together, he asked “Can I start on the back?” Needless to say, I was very excited and impressed and he started his lines on the back and showed me where “he” was going to start and how “he” and his line was going around this way and that. I was very happy with this not only because it showed a lot of creativity and some rebellion, but it also was exactly the kind of out-of-the-box thinking that makes me happy with the potential for the project. For whatever reason, other students were not comfortable with or did not think about really re-interpreting the instructions. Yet, students such as the two above that I mentioned really stood out to me because, to me, it felt as if they actually took full advantage of the integration aspect and actually added their own creativity and interest to the project. Yesterday was the last day of the second week of the Kala Math-Art project. This week we worked in Mr. MacCarthy’s 6th grade math class. And what a difference a grade makes! The students in this class were very energized and talkative, which was great for participation, but it was a bit challenging to keep them focused. Because of this, we tweaked our teaching method so they could work at their own pace and help each other learn. I first attended the Tuesday morning session, where Victoria presented the Kandinsky painting, much like we did with the King Middle School students. Many students raised their hands to point out which shape stood out to them the most, and this concept transitioned into discussion of the rule of thirds and asymmetry. Next, we had the students do the first warm-up drawing, which can be seen in detail in our previous post. The students struggled most with dividing the paper into fourths. In addition, there was much concern with how to begin the steps, and again the question arose: “Am I doing this right?” However, these students seemed more content to deviate than the previous group of students we worked with. On Thursday, Victoria described the math concepts related to the students’ second warm-up. Then the students began the final project with a longer set of steps. This project was different from the initial warm-up because instead of demonstrating the steps on the document camera while the students follow, we had them interpret the steps on their own. This proved more effective with this group of students because they were able to work at their own pace and help each other throughout. Each student provided a different knowledge of math vocabulary and skills that, combined, enabled them to work through the steps. Many students were completely self-sufficient for the dilation exercise, which was very impressive considering it was the most difficult step. This week’s experience really taught me that it is sometimes necessary to tweak curriculum or teaching styles for different groups of students–and that’s ok! Our goal is for the students to have fun and get enthused about math and art, and if that means we as instructors need to hold back and let them explore, or maybe tighten the reins and give them one-on-one help, then we will adjust our methods to meet their needs, just like we have been edited and re-editing our instruction sets. The environment this week has been very energetic, and at times hectic, but the students’ active participation and enthusiasm has been worth the chaos. Looking forward to next time. I made it to just the first day with Mr. Mac’s class. As far as the lesson, we began the class in a much similar way as the last school. We introduced ourselves and then worked with the Kandinsky drawing to connect the two subjects of math and art. The students did extremely well coming up with great vocabulary lists of both math and art vocab. 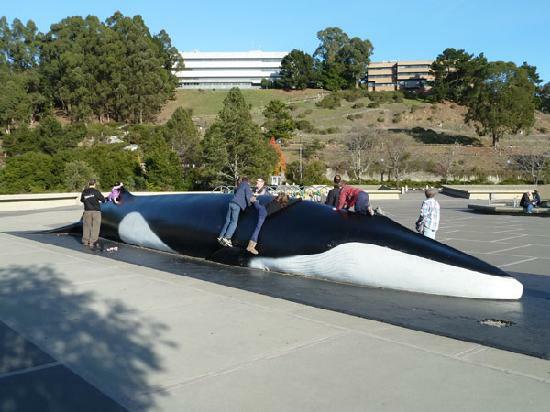 In our intro, Risa also used a poster with a scale model of the whale from the Lawrence Hall of Science (which basically ALL the students had seen before) as a means of demonstrating that artists find using math as an important way to make sure drawings are proportional. Working through the dilation proved to be the more difficult task of the day. From a curriculum standpoint, there seemed to be a noticeable enough difference between the 7th grade and 6th grade. We noticed a difference in motor skills- working with the compass was just a bit more complicated for these students. Also, the attention seemed to be tougher to work with. This made it really hard for us to get all the students to be on task at the same time. Some students were waiting for the next instructions while other students were getting left behind. However, on the flip side, the classes were VERY excited and interested by the project when we could keep their attention. After the first day, we decided to work on some ways to tailor giving the instructions in a way that would better adapt to the grade level and energy level differences from our last grade. Today (Jan 23) is the first day for our Math-Art project and we are starting off at King Middle School in Mr. Dejean’s 7th grade math class. It was very exciting to finally be in the classroom! The students were very engaged and focused and had a lot to say about the information that we were giving them. Today was a Math Day, so Risa, our math representative from Lawrence Hall of Science, introduced the math vocabulary and concepts which will be our focus for the math portion. We started out thinking about how art and math can be related, with this image from Kandinsky. After presenting the image, Risa asked the students to write down math and art words that come to mind when looking at the painting. The class discussed their answers with partners and then Risa moved into a focus on triangles and similar triangles, based off the large isosceles triangle in Kandinsky’s painting. The math vocabulary of ratio and similar were focused on as well as complementary angles and other vocab. Once the vocab was discussed, we moved onto teaching the students about dilation-the process of changing the size of a shape while keeping the same ratio so that the shapes are similar. We introduced compasses for the students to use as a way of measuring sizes and asked them to dilate a triangle to three times the original size. To wrap up each period, Risa ended with some “Magic or Math?” questions to reemphasize the importance of order of operations in math and following instructions in a specific order- a concept that will be connected to the art portion. To the surprise of the students, after they finished the instructions, Risa and Victoria were able to guess the other digit of their final number. For example, if a student stated one of the digits was a 7, Risa and Victoria could guess the other digit to be 2. The trick is that the two digits will always add up to nine. The students multiply their original number by 10 and then take away one of those numbers by subtracting, leaving them with 9 times their original number. The students LOVED the magic behind the math and one student even asked Victoria if she was a wizard! Overall, the first day was realllly awesome and I already can’t wait to go back on Wednesday for the first art day! Day 2 for me at King (Jan 25) was very exciting and a little bit more tiring than my first- we met with all four periods today! It was the first time introducing the Art portion of the project with Victoria Scott, our lovely Kala artist. We started each period out with some practice warm-up drawings to introduce the students to the materials we gave them and to have them get used to following instruction sets to make drawings. We had the students split their paper into four equal parts. 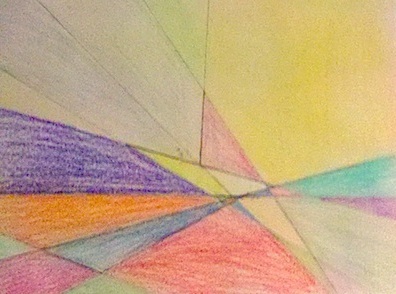 In the first section, the students were to draw freehand diagonal lines in a color of their choice. The second box was filled with wavy intersecting horizontal and vertical lines. The students than colored in 5 of the shapes they created with the intersecting lines. In the third box, the students randomly made 20 points and then connected them in whatever they chose. In the last box, the students made one long line made up of alternating straight and wavy lines. The students were mostly skeptical at first and had some difficulty dividing the paper up. But, as we moved along through the exercises all of the students became more and more creative and enthusiastic with their own drawings. One question that continuously came up was, “Am I doing this right?” or a variation of this question (Can I do this? Yes. How should I do this? It’s up to you.). We ended up writing on the board “Yes! You are doing it right,” to reinforce that the students can and need to make decisions that will affect their drawings- decisions that artists make all the time in making their art. Once the students gained the confidence of making their own decisions with their drawings, we began seeing some beautiful designs and color combinations, and creative interpretations. After the warm up exercises, we ended with an art history lesson that related to the drawings the students had just finished. Victoria discussed the Constructivist, Conceptual, and Digital Movement and introduced the students to beautiful and colorful images to give the students an idea of how other artists have worked using similar instruction sets. She then posed the question, “Are there rules to art?” which made the students think. Many believed that there were no rules to art. Victoria then ended the period by answering that many artists make up rules and instructions in order to make it easier to approach their art, which ties into the large drawing we will be making tomorrow and Friday using an instruction set that Victoria created. We had our last official day with King Middle School yesterday (Jan 27) and it ended on a pretty high note. Victoria started out the period with a composition instruction set to demonstrate some techniques that artists use to make interesting looking art. The four compositional techniques we introduced were symmetry, asymmetry, radial symmetry, and the rule of thirds. Out of all of these techniques, radial symmetry was the only time the students were given an instruction to put an object in the center of their panel. This was emphasized by the rule of thirds which says that if a drawing is split into the ninths (a tic-tac-toe grid) the majority of the elements or objects in a piece should be on the outer parts and not the center. This allows for more movement in the viewer’s eye. The students asked almost no questions about their own artistic decisions (such as color combinations and if they were doing it right). This was a HUGE change from the first art day on wednesday. I even overheard students defending their decisions when other students asked about them- awesome! The majority of the students understood the dilation once we gave a little guidance. One final hope that we are looking in to is if we can return in the future to have a capstone experience with the classes to discuss their time over this past week. We are also trying to look into the best way to document the experience by either having the drawings in a book, an animation, an installation, or some sort of display. Overall, it was great being able to see each students working within the instruction sets and adding in so much of their personal creativity. It was a very rewarding way to end the week. Today ( Jan 24) was my first day at King Middle School; I was only able to attend one math session but it was still a lot of fun! I did not know what to expect before class started; I didn’t know whether the students will enjoy the activities designed for them and if they will accept a class taught by “outsiders”. This feeling eased when Victoria showed me portfolios created by Monday’s classes. 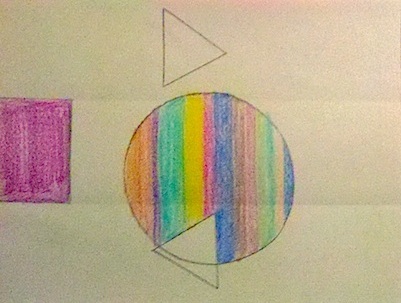 With simple use of lines and circles, the 7th graders produced very creative patterns and pictures! 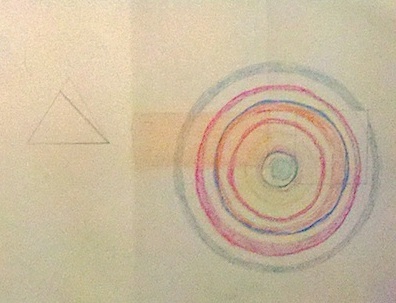 The rundown of the class was the same as yesterday’s, beginning with comments on Kandinsky’s Komposition 8. Just by reading the student’s response to the picture, I realized they do have a deep understanding of geometry and are very creative indeed. While most were able to write down “triangle” and “lines” as we expected, some students even came up with words like “sun” and “mountain”! The class was then given time to use compasses to create circles on their portfolios. Most of the class had trouble at first, but after some practicing, they finally got the hold of effectively using compasses, which proved to be useful in the exercises that follow. We ran out of time in the end and did not get to go through all the “Math or Magic” problems, but the idea of the importance of following instructions was still conveyed by Risa. This will become a point of improvement for future workshops. Overall, I think the students did find the class interesting, and we are all looking forward to starting the art-focused workshop tomorrow! My second day at King was January 26. It was my first art class with the students. Similar to Pascal’s class on Wednesday, Victoria kicked off by having the students warm up to drawing and to following instructions. We then moved on to completing the real instruction set. At first, a lot of students were hesitant to freely create whist using the instruction set; they kept checking with us if they are doing the right thing or not. As Pascal mentioned, there is no right or wrong, as in art and in some applications, math as well. One thing I noticed was that a lot of students were not familiar with the concepts of “diameter” and “radius” when using a compass. Many of them confused the length measured using a compass as the diameter of the circle. 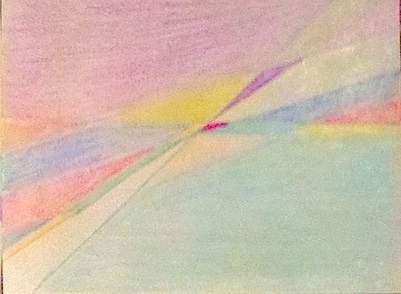 Some also needed help with the dilation process, but all of them succeeded in creating unique, personalized drawings in the end. We ended the lesson by having the students line up and taking photos of their individual drawings. Even if some students were not too enthusiastic about the exercises in class, all of them were very proud to showcase their artwork. I hope that after this class, they not only learned some basic art and math concepts but also be able to take away the pride and feeling of accomplishment from expressing their own creativity. For me, I found it very fulfilling to hear a student say at the end of the day “I hope we did this more in class!”. 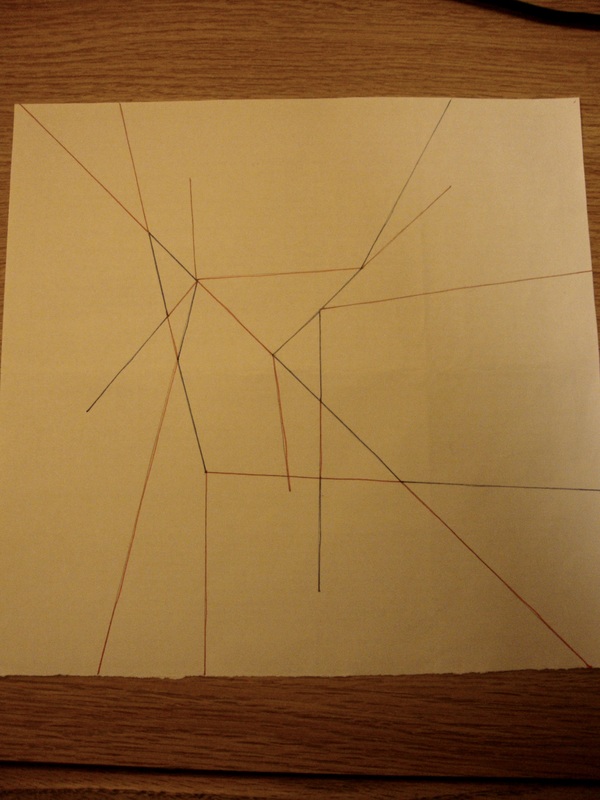 Another step that the students had the most questions about was the grid-making; a lot of students made their parallel family-member lines far apart, so they were disappointed when they could not connect them with perpendicular lines, thus forming a grid. More direction on this step may help, but perhaps it is good for them to realize that things don’t always work out exactly how they had in mind, which occurs in art all too often! I think it’s safe to say that we had a great week at King Middle School, and we’re looking forward to the next! We had our last meeting of 2011 on December 1 at the CalCorps’ office. With us this time was Mr. Roald Dejean, the math teacher from King Middle School, who is our first teacher who will be doing the Math-Art Project. At this meeting we made sure that we were all on the same page before the break and the interns were given some final tasks to finish up over break. One task we were given was to create a “pitch” to be used for our classrooms to introduce three different art movements that we are going to cover- the Constructivist, Conceptual, and Digital Art movements. Throughout history, artists have constantly been trying to think about art in new creative ways. An art movement occurs when many artists share a common idea that connects all of their art together. Three movements that we will focus on are the movements of Constructivist Art, Conceptual Art, and Digital Art. The Constructivist Art movement occurred first out of the three and occurred during the 1920s in Russia. The artists in this movement experimented with how materials, like wood, glass, and metal, could be used in new and practical ways so that their art could actually be useful for normal people. The next movement is the Conceptual Art movement which occurred in the 1960s. The idea behind this movement was that the meaning behind a piece of art can be just as important as the way it looks. Artists in this movement wanted to make the viewer actually think. Similar to the Constructivist Art movement, this was very different than a more traditional way of art where it was mostly for viewing pleasure. Digital Art is the most recent movement and began in the 1990s. The connection behind this movement is that all of the artists in the movement use technology in some way to make their art. Digital artists are continuously finding new ways to make new kinds of art by making new technology or using technology in innovative ways. Lastly, Roald gave us some Takeaways on teaching a class and shared some of his class rules to give us some insight on how the classroom environment will be when we start teaching. He said that most importantly we should be comfortable with ourselves. We should be honest with the kids and with ourselves. We should have no judgments or preconceptions. He encouraged enthusiasm and goofiness as well as being clear and respectful. Some of his class rules included call and response, hand signaling, staying in seats, regular warm-ups. Over the break, we each tried to write our own instruction sets for each other to draw out. We came up with two instruction sets and each derived very different results! Draw three triangles. The first triangle is obtuse. Start the second triangle from the midpoint of the largest side of the first triangle. Double the size of each side for the second triangle. Start the third triangle from the smallest side of the first triangle. Triple the size of each side for the third triangle. Extend all lines from the triangles until they reach the end of the page. Alternate warm and cool colors. Draw an equilateral in two of the three parts. Writing our own instruction sets and trying them out helped us determine the level of difficulty of the instructions and refine the use of appropriate vocabulary. We hope you enjoyed the drawings! Larger versions can be found in the photo gallery.